Low-E coatings are also applied to thin sheets of transparent film and suspended in the cavity between glazings. 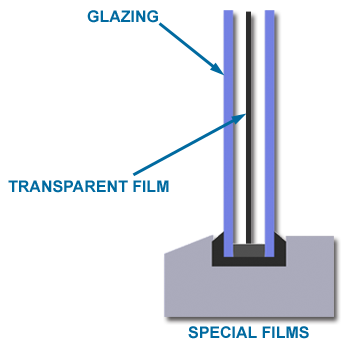 This process is often used to create a triple glazed unit without the added weight of a third pane of glass. Some films are designed to combine low emissivity with reduced solar gains making them effective for certain west facing windows if solar gains are a severe problem during the summer. This may have the effect of using more energy in the winter so care must be taken to ensure the right film is used in the right application.